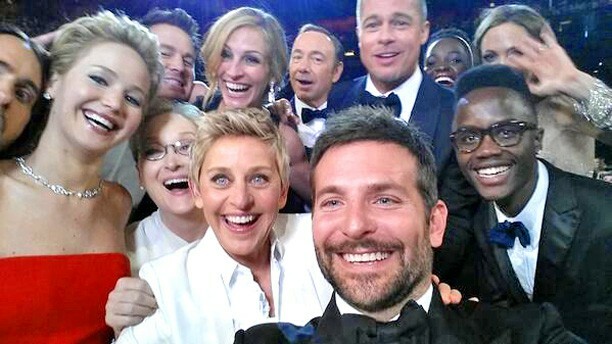 Did Ellen’s Celebrity Filled Selfie Break Twitter Record? Oh no, Ellen broke the internet…well not really but the 2014 Academy Awards host did happen take down Twitter for a brief moment! After Ellen took a very selfie with a few of her celeb friends Twitter was temporarily down! Ellen also broke the record for most re-tweets over 2 million …breaking the last record obtained by President Obama with 778k…wow! Ellen tweeted, “If only Bradley’s arm was longer. Best photo ever. #oscars” along with the photo. Even the Academy felt bad for talking down Twitter for a moment, “Sorry, our bad. #Oscars” with Twitter’s famous blue screen with the words, ‘Something is technically wrong.’ Way to go Ellen! Did Christina Aguilera Suffer a Nip Slip? LeAnn Rimes & Brandi Glanville Have Called a Truce! Britney Spears Forced To Cancel Vegas Shows After Ankle Injury!